CNN debate rules: Carly Fiorina set to make main stage thanks to CNN rule change. 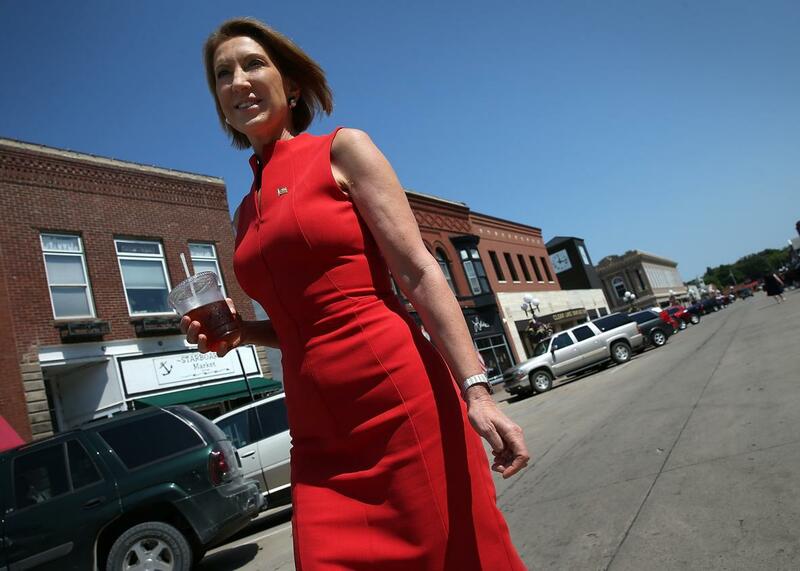 Carly Fiorina walks down Main Street after having lunch at the Starboard Market August 14, 2015 in Clear Lake, Iowa. Carly Fiorina, who dominated the Fox News undercard debate in Ohio, is now on pace to take part in CNN’s main event in California later this month—thanks to a little help from network executives and the Republican Party. On Tuesday, CNN rewrote the selection criteria for the pair of GOP presidential debates it will host on Sept. 16 in such a way that should allow Fiorina to snag an invite to the top-tier event even if she doesn’t crack the official top 10 in the network’s chosen polls. The convenient (though not unfounded) reason for the change: a shortage of recent surveys. The original selection criteria were set to include an average of polls taken by a preselected group of pollsters between July 16 and Sept. 10. The problem with that, though, was that while there was a slew of approved surveys taken before the Fox News debate on Aug. 6, there have been only a handful of them taken since. Or as CNN officials put it Tuesday: “In a world where we expected there to be at least 15 national polls [taken between the Fox News and CNN debates], based on historic precedent, it appears there will be only five.” Without a change, a candidate’s polling performance prior to the first GOP debate would effectively have been more important than his standing after it. That was good news for the likes of slumping Chris Christie and Rand Paul, but bad news for the surging Fiorina. With the change, the 10 candidates who would have qualified under the original polling criteria will still earn invites—but so will any candidate who cracks the top 10 in an average of a smaller and more recent sample released between Aug. 7 and Sept. 10. According to CNN’s current projections, that means the main stage is on track to include the 10 men who took part in Fox News’ prime-time debate—plus Fiorina, whose original CNN polling average was being dragged down by her lackluster showing in polls from before the first debate but who has since climbed to seventh in the RealClearPolitics national average and fourth in the Huffington Post’s. GOP officials, who have been quick to stress that the networks are in charge of the selection criteria, gave CNN’s change their blessing. That makes sense for a couple of reasons. For starters, Fiorina performed well in the first debate and voters appear eager to see her try her hand at the adults table. As I’ve noted before, though, more important for the party is that Carly’s presence could provide an important counterweight to Donald Trump and his particular brand of misogyny.